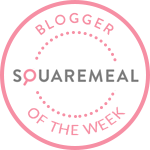 Not all my meals at restaurants make the blog, I've been mainly writing about fine dining establishments, with a focus on those which provide vegetarian menus, and those with Michelin Stars. Chain restaurants, average, bad and even decent casual meals don't usually get blogged. Today though, I had a terrific lunch at Royal China, worthy of a write up. Royal China is a group of restaurants known to me, many years ago my family visited the Queensway branch regularly. The restaurants are very popular with the Chinese community, always a good sign. One our team members at work had her last day in the office, as she was heading off on maternity leave and wanted a goodbye lunch with the team. Upon arriving we were sat at 2 large tables, with 16 of us they didn't have a table big enough. 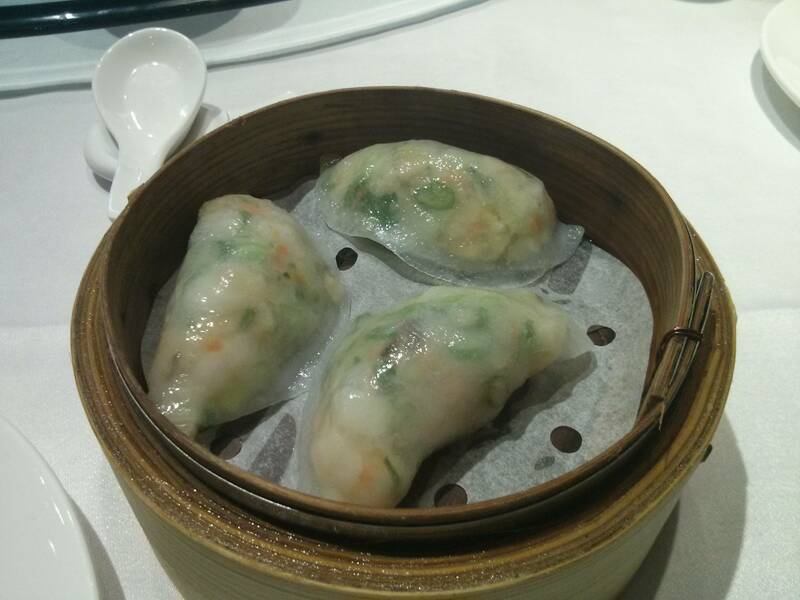 A choice of a la carte menu or dim sum menus were available. Most on my table went for soup and a dish from the a la carte menu for a main course, with rice and vegetable dishes to share. I went for a selection of dim sum. Prawn and coriander dumplings had a nice crunch from water chestnuts, prawns were fresh and well cooked, and a strong coriander taste. 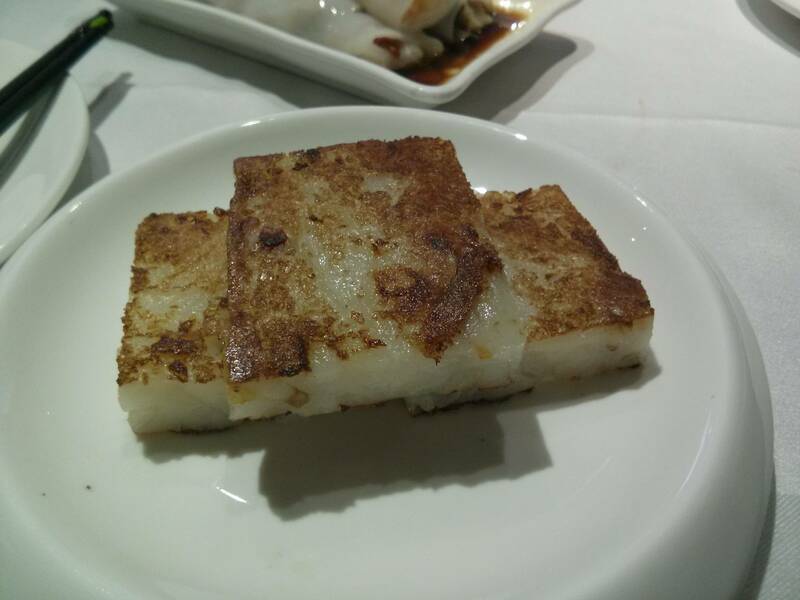 Chinese turnip (daikon) and cured meat cakes were unusual, sticky from the cornstarch binding , but plenty of daikon and cured meat that kept their flavour. Royal China Cheung Fun were 3 different cheung fun, a superb king prawn, with excellent tasting prawns, one with pork, with a nice sweet and savoury char sui pork, and one with tofu. 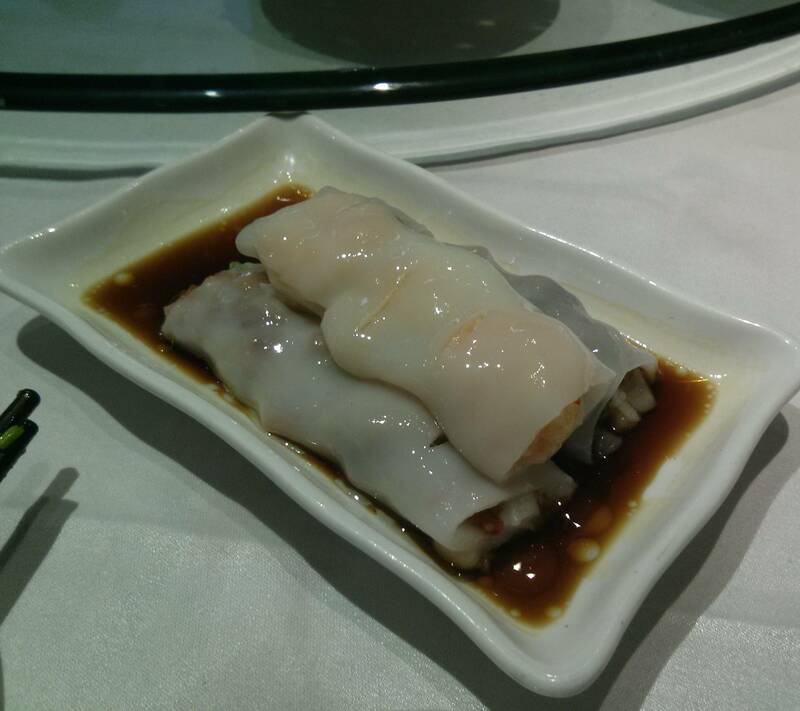 These were the best of the dim sum, slippery, wafer thin cheung fun, well packed with tasty ingredients, and laying in a particularly good soy sauce. 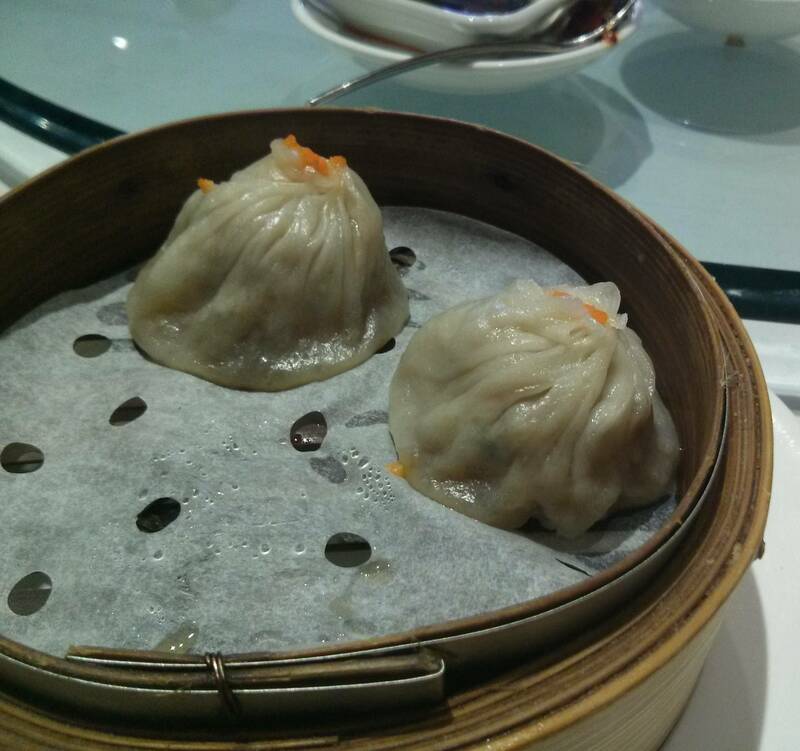 Xiaolongbao are Shanghai Pork Soup Dumplings, steamed dumplings, filled with a pork mince and a liquid soup. 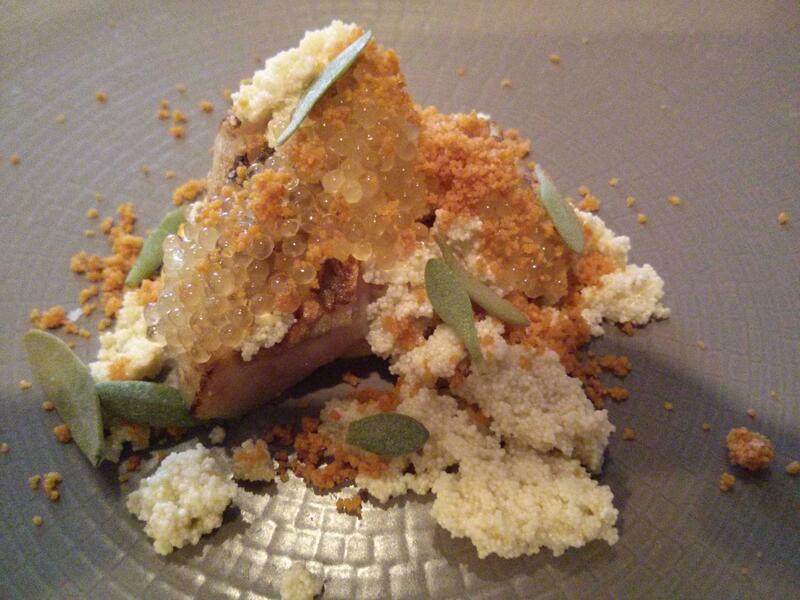 I had the molecular version at Bo London, and it was good to try the original version. These had an excellent pork mince, and filled the mouth with an excellent pork soup when bitten into. They came with a sweet vinegar dip that matched the richness of pork fat in the soup very well. I also tried some Kai Lan (Gai Lan/Chinese Broccoli), one plate with garlic and one with ginger. The kai lan was steamed well, retaining some crunch without losing any flavour and freshness. I also tried a Char Sui Bao, a pork steam bun, this had an excellent bun, very light and fluffy with a sweet pork centre. Also sampled was crispy chicken, this was half a chicken in an excellent sweet and incredibly shiny glaze, albeit a bit dry. A sweet and sour chicken, prawn kung pao and chicken and noodle dish were ok.
Service was quick, they must be used to the legion of suits from Canary Wharf having lunch, and most but not all dishes came out at the same time, although all my dim sum came out between my colleagues soup and main courses, so they all had a laugh watching me take pics and eat it until their dishes arrived. My dim sum were £3.30 - £4.50 for 3, good value for their quality, and best of all our boss covered the entire lunch for all 16 of us! I was impressed with Royal China, I ate at the Queensway branch many, many times in the Eighties, my father was PR and then GM at a group of London casino's. He covered South East Asia so we were regulars when we wined and dined his punters, but that was many years ago, I was much younger and more interested in quantity than quality, and I haven't tried too many high end Chinese restaurants since. I will certainly return with my wife at some point, I know the tofu has a good reputation, and a number of vegetarian dishes were available. Since starting my gastronomic journey to some of the finest restaurants in London and UK, I've always wondered what was the difference between a 2 and 3 star restaurant, and now I know. The Waterside Inn was originally established by the legendary Roux Brothers, Albert and Michel, a family so entwined in the history of fine dining in the UK they form its very bedrock. These days the Chef Patron is Alain Roux, son of Michel, and under him it has retained its 3 Michelin Stars for an astounding 28 years, the longest held by any restaurant outside France. We arrived late afternoon, and the car parking being taken care of by the doorman and bags taken to reception. 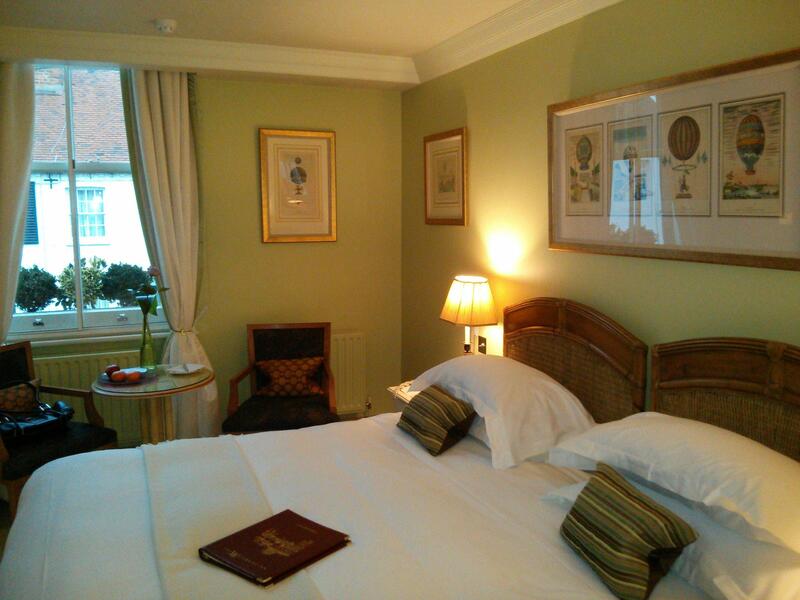 We were shown to our gorgeous, luxurious room overlooking Ferry Road and were made tea. We went for a walk around Bray, a beautiful village packed with wonderful examples of historical buildings and architecture, including passing by The Fat Duck to check it out and to give me an idea of where it was so I knew where to come when I inevitably book. After heading back and spending a few hours relaxing and dressing for the occasion we headed down to the restaurant itself. I realised the service was going to be something special, as the door was opened before I could reach for the handle, with one of the staff being positioned behind to listen for footsteps down the stairs. We were warmly greeted, and chose to sit in the lounge to read the menus and have our champagne and canapes. The Menu Exceptionnel was brought to me, and the vegetarian menu for my wife, along with 2 glasses of their signature champagne. The absolutely charming Diego Masciaga introduced himself and asked on our choice of main course. I also asked if it was possible to change the foie gras course for something else, not wanting to risk my stomach being overwhelmed. This was not a problem of course, and Diego recommended a fish dish for me to try, and as to be revealed later in the post, an superb recommendation and choice. The canapes arrived shortly after, a large but incredibly light cheese gougère, a fabulous smoked eel tempura made with a particular fine smoked eel, and a quenelle of I believe foie gras. My wife had the gougère, a mix of mushrooms and onion, and potato and leek on a stick. The wine list also arrived, and I must confess I have little experience in choosing wine, so it was little more a case of browsing through to find the most expensive bottle, an impressive 12 grand bottle of Petrus. The sommelier arrived and as always I relied on his skill and knowledge to make a recommendation, we chose the wine flight to match the menu. We were soon invited into the dining room as our table was ready. The dining room wasn't a huge space, but well appointed in a pleasant green colour scheme, with large glass windows and doors overlooking the terrace and jetty into The Thames. We were in the centre of the room behind the service area, upon which sat a large silver duck press, on a good sized table packed with lovely tableware. The menu card and wine menu were already set up on the table. We were offered either a white baguette or brown roll, these were warm and came with a particular fine butter. 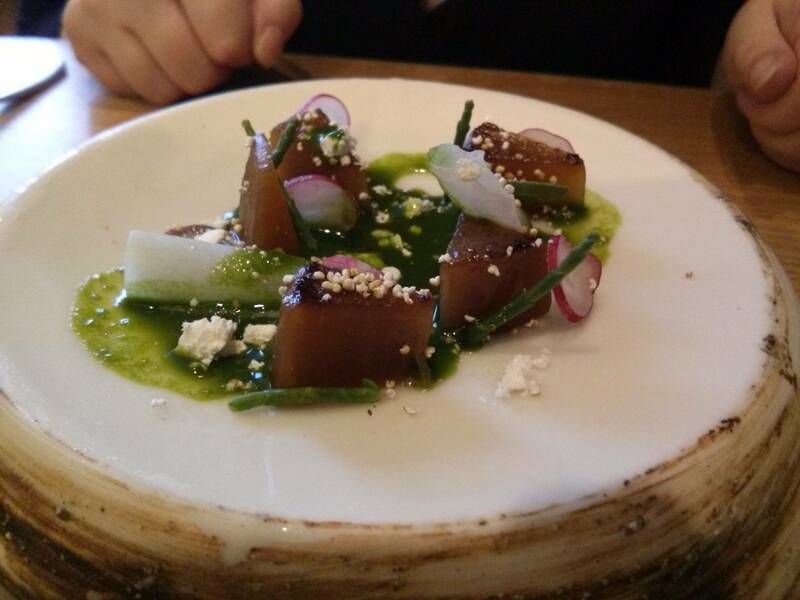 Our amuse bouche arrived soon after, for me a roll of smoked salmon, in which was set octopus, prawn and samphire in a light and delicate jelly and a garnish of what I think was sea purslane, a fleshy, salty and juicy plant I've not had before. This was a lovely refreshing start to the meal, the octopus perfectly tender, and all elements well flavoured. 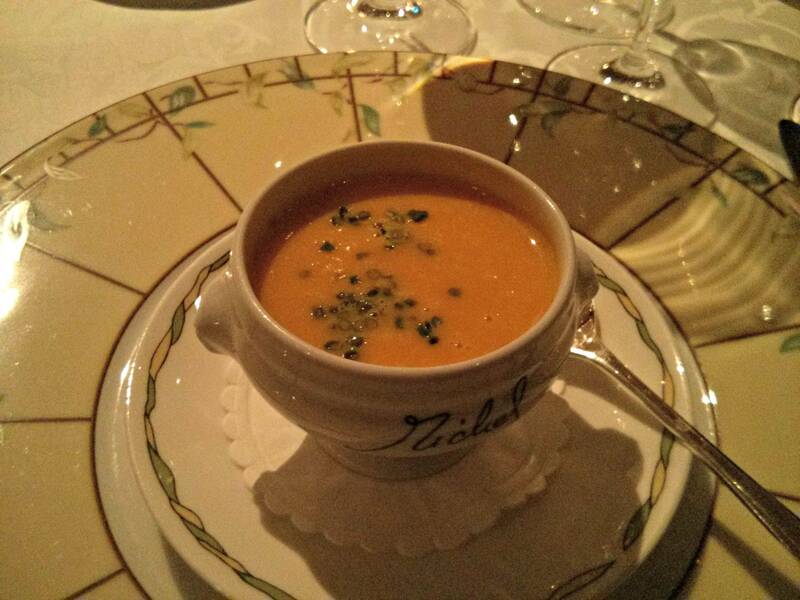 My wife had a cute little tureen of a pumpkin veloute, with soft, buttery mushrooms. The pumpkin was sweet, rich and creamy and went well with the mushrooms. 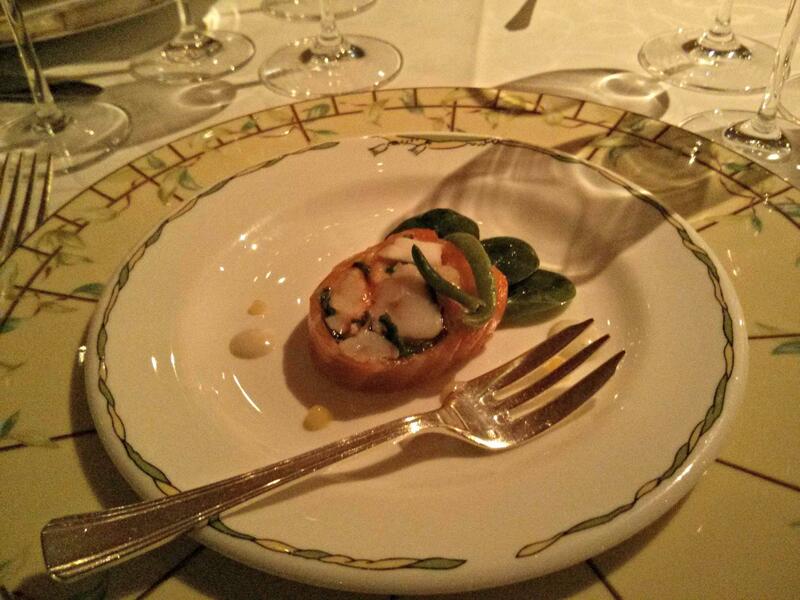 The sommelier then arrived with the first of our wines, a Grand Siecle Laurent Perrier Champagne to match our starter. This was fresh, crisp and fruity champagne and a few sips later our starters arrived. For me a cold dish, smooth parmesan cream, in which were pink fir apple potato, asparagus, truffle and with this a straw of hot almond puff pastry. The pastry straw was simply divine, and stunning piece of pastry work, and dipped into the cream was an amazing taste sensation. The cream, potato and asparagus was a lovely combination, with great ingredients, the potato and truffle earthy, the asparagus sweet all underlaid with the umami rich creamy cheese. The vegetarian starter was a leaf salad surrounding a fantastic celeriac and apple remoulade, this was garnished with root vegetable crisps. The salad was dressed with cider vinegar flavoured vinaigrette, each leaf perfectly coated, the dressing a perfect balance of acid and sweetness. The remoulade was rich and creamy, with the celeriac flavour quite delicate. This was a particularly nice salad and great start to the meal. Cremeux de parmesan a la truffe et cornes de gatte, accompagne d'une allumette feuilletee aux amandes. Salade hivernate garnie de celeri remoulade et pomme en l'air vinaigrette au vinaigre de cidre. Our next wine was meant to be a sweet wine, a Coteaux du Layon St Lambert Domaine V. Ogerau 2011 to go with the Foie Gras course, and but I had to remind the sommelier we had a vegetarian and fish course instead, but asked if I could try anyway as I have a sweet tooth and would love to try. This was aromatic, sweet and fruity and delicious. 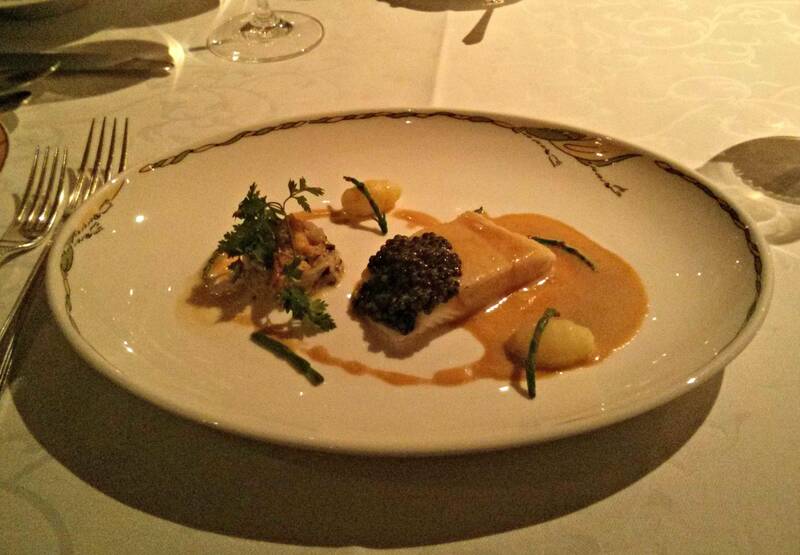 The fish course, recommended by Diego arrived at the table and immediately bowled me over with a simply awesome aroma, a fillet of halibut, poached in sea water came coated with oscietra "Royal Belgian Caviar" and with a sea urchin sauce. The fish was beautiful, soft and delicate, the caviar sweet and salty without overpowering the fish and the sauce an absolute sensation, fantastic in aroma and taste, this came with 2 tiny turned new potatoes, a duxelle of mushrooms and some samphire. This was easily one of the best fish dishes I've ever had, every element was perfectly cooked, rich with flavour, well balanced and combined to provide a triumph of a dish. I cleaned every single scrap of sauce and caviar egg with the bread, not wanting to miss even the slightest bit. Thank you Diego! For my wife, the vegetarian alternative was the parmesan cream, and I am glad she did not miss out trying this dish. She too adored the pastry remarking it was the best she has ever had. A white accompanied this course, but alas we did not record the name. Filet de fletan poche dans son eau iodee et nappe grains de caviar oscietre "Royal de Belgique" sauce oursinade. Our next glass was the nicest of the evening, a Bourgogne Hautes-Cotes de Nuits "Clos St. Philibert" Domaine Meo-Camuzet 2004, an aromatic and flavourful white, crisp and fresh. This was unlike any white I've had before. With this was a classic Waterside Inn dish, lobster medallion with a white port sauce and ginger flavoured vegetable julienne. 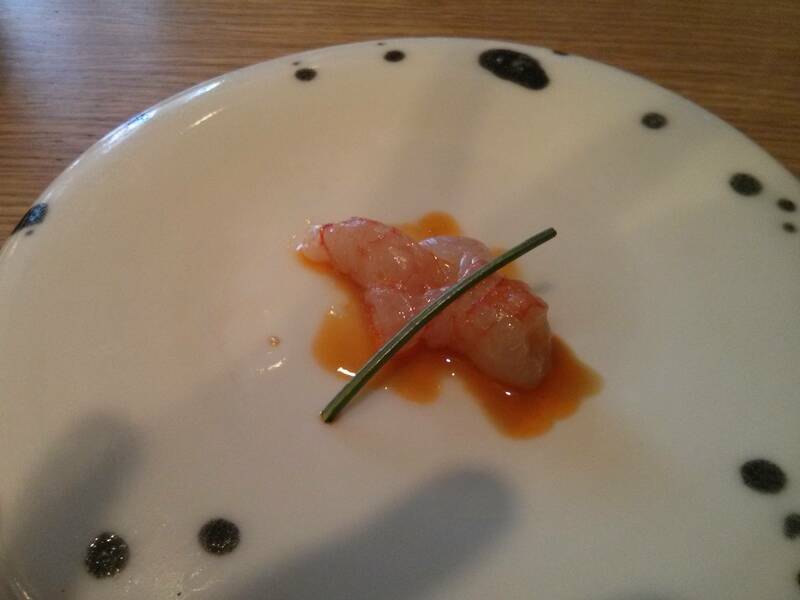 The plate held a generous tail segment and huge claw, the sauce was sticky and sweet, with a bite of chili heat, matched perfectly with the ginger in the vegetables. The cooking of the lobster was again timed impeccably, soft and sweet and I know the restaurant keeps their lobsters in a tank, it couldn't have been fresher. Again I mopped the plate clean with the bread, not wanting to miss a single taste. 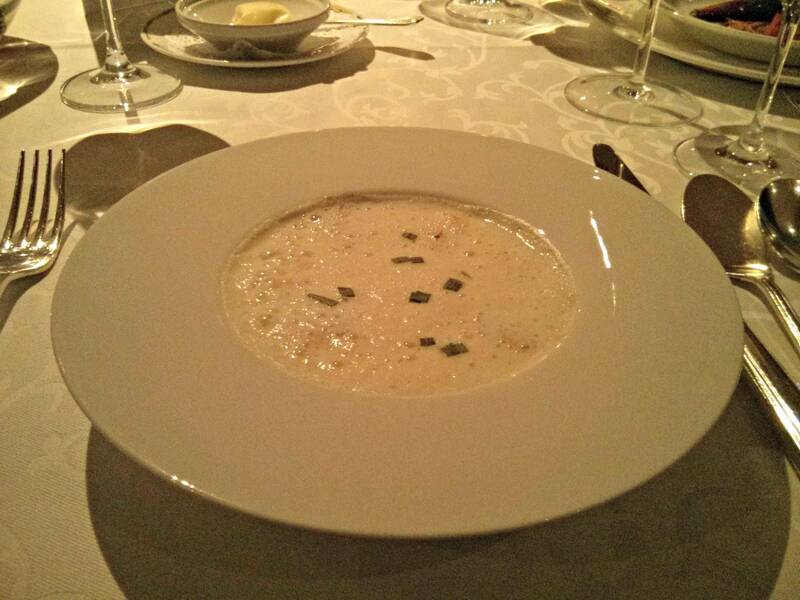 My wife had a fantastic cream of Jersusalem artichoke soup, the soup well flavoured with earthy jerusalem artichoke, but quite light, in which were some fine mushrooms and chestnuts. The chestnuts in particular earned full marks from wife and this was an excellent dish. Tronconnettes de homard poelees minute au porto blanc. Veloute de topinambours garni de champignons sauvages et chataignes. With our main course we had a red wine, a Chateau Marquis De Terme Margaux 2006, a fruity bordeaux. This was of course well matched with my game dish, a duo of venison and partridge. The venison was served pink and was tender and tasty, the partridge was particularly good, deboned, surrounded with a forcemeat stuffing and utterly delicious. This came with a brilliant poivrade sauce, an amazing buttery subric of pumpkin, a super smooth buttery cake of pumpkin filled with spinach and wild mushroom. 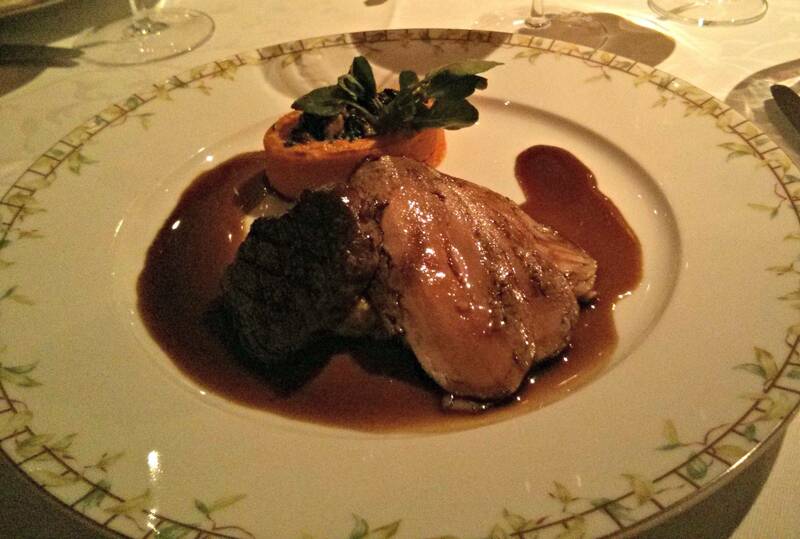 I loved this course, the meat and sauce and pumpkin combined to form a delicious mouthful. 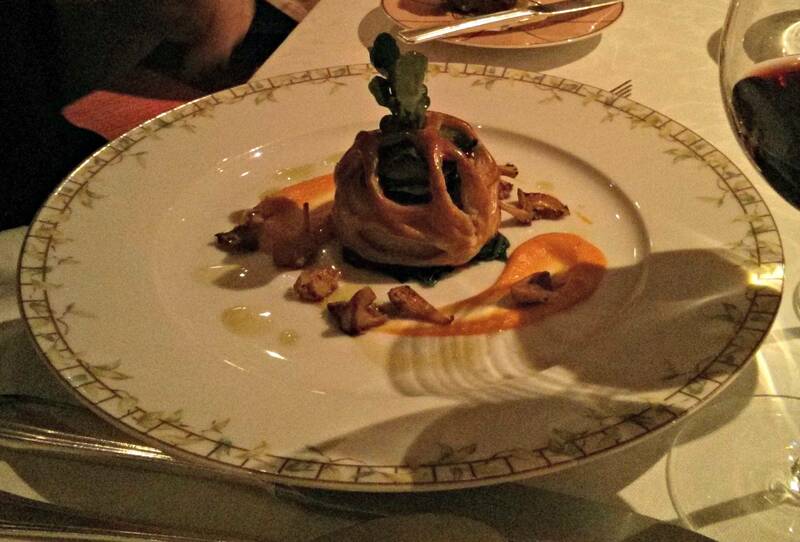 My wife had chosen well, a disc of artichoke was topped with saffron scented celeriac, over this was a fantastic veil of puff pastry, a complex decorative touch reminiscent of classic dishes from Escoffier and Careme. Again the pastry was excellent, and providing a buttery textured crisp bite to match the perfectly soft artichoke and celeriac. With this a sweet rich puree of pumpkin. 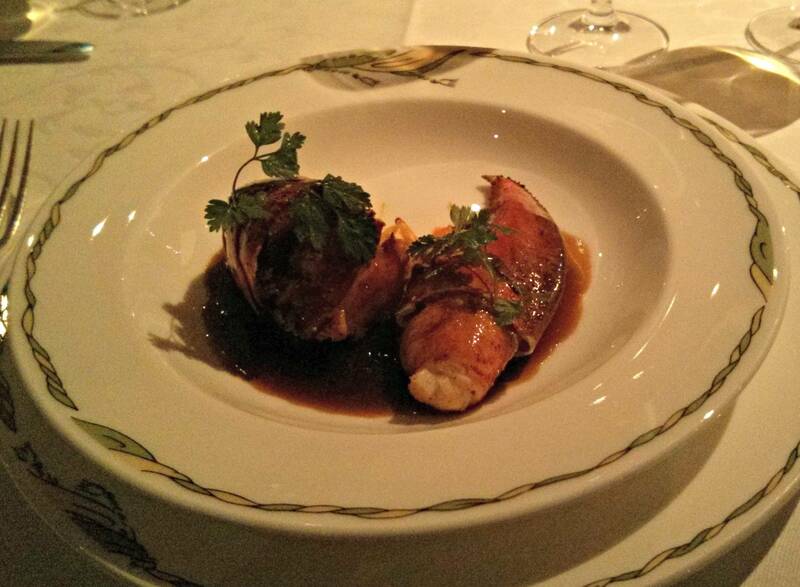 This was a great ending to her meal, a dish rooted in classical french cookery, yet modern, inventive and delicious. Not a single vegetarian dish fell back on any cliched alternative to meat dishes, all were designed to hold their own against any of the other dishes on the menu. Duo de gibier se saison, subric de potiron et champignons sauvages enrobes d'epinards, sauce poivrade. Fond d'artichaut et lamelles de celeri-rave safranees habilles de dentelles de feuilletage, coulis de potiron. 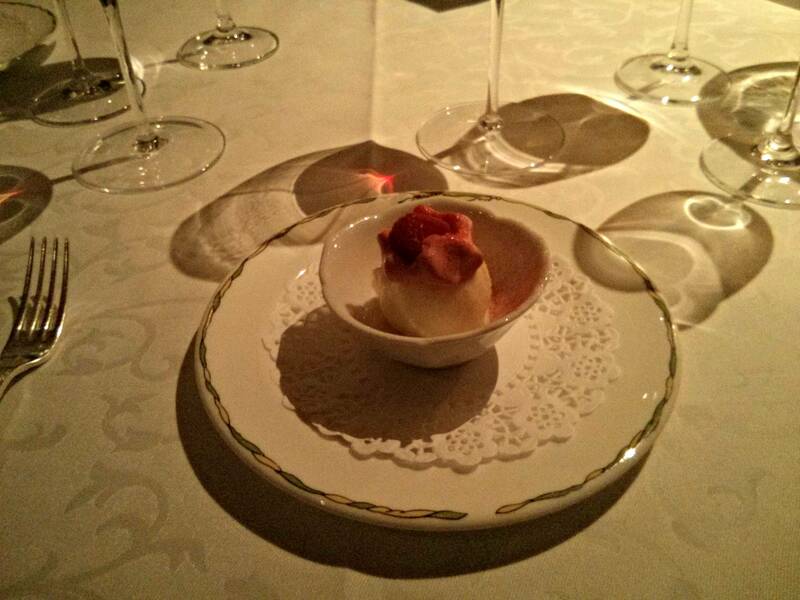 Our pre-dessert was a tequila sorbet topped with raspberry. This was a lovely palate cleanser, holding the tequila taste really well and an aromatic and sweet raspberry to top it off. The dessert wine was a Chateau Climens Barsac 2004, a complex taste with a recognisable scent of burnt sugar and candy floss. 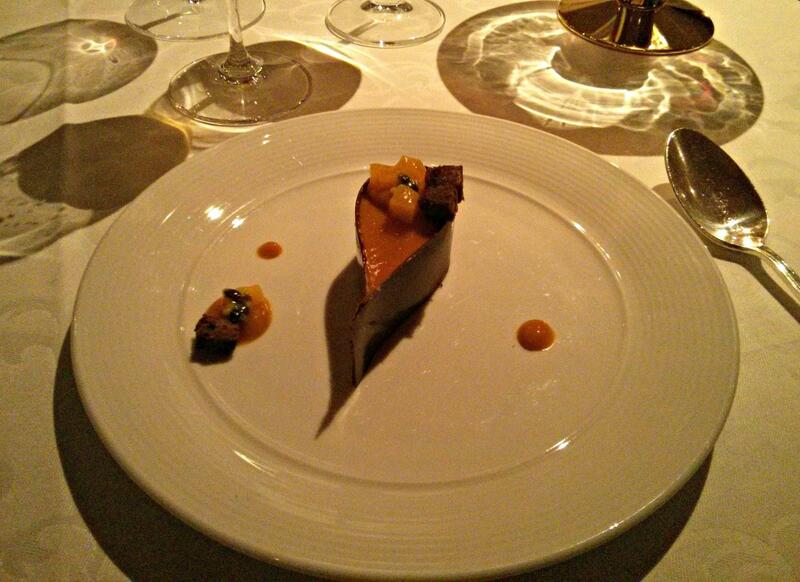 Our first dessert was for me a teardrop of milk chocolate, with chocolate and caramel mousse and topped with mango and passion fruit. The mousse was gorgeous, light and packed with flavour, the caramel part in particular absolutely gorgeous. The passion fruit and mango providing an aromatic perfumed topping, sweet yet a hint of sourness to balance the chocolate and mousse. My wife had a creme brulee of pistachio with a croustillant of vanila ice cream. This was a fine example of its kind, the pistachio flavour and caramelised crunch providing a rich and luxurious mouthful. By this point descriptions and photos might be a bit blurry, the full effect of our wine flight being apparent. Larme de chocolate lacte au caramel, coeur de mangue et fruits de la passion. 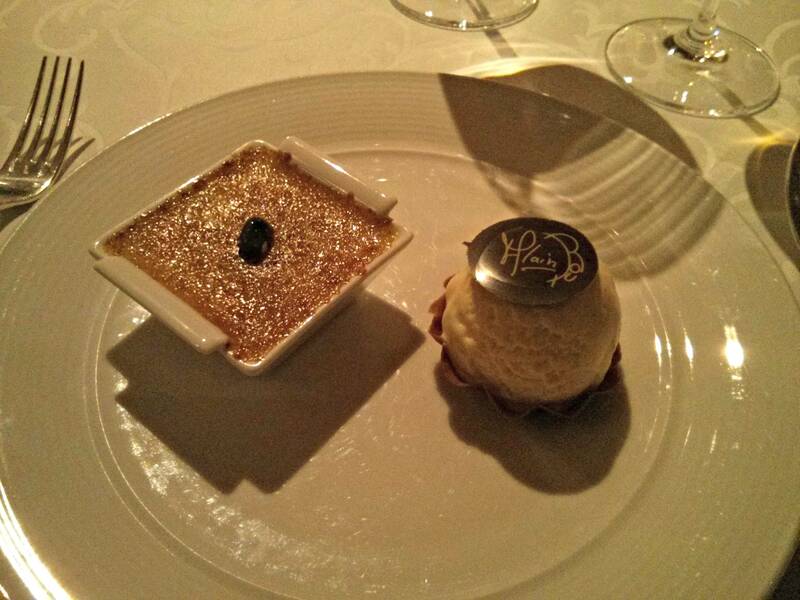 Creme brulee a la pistache, glace vanille. We both ended with the warm soufflé of orange with cranberries. 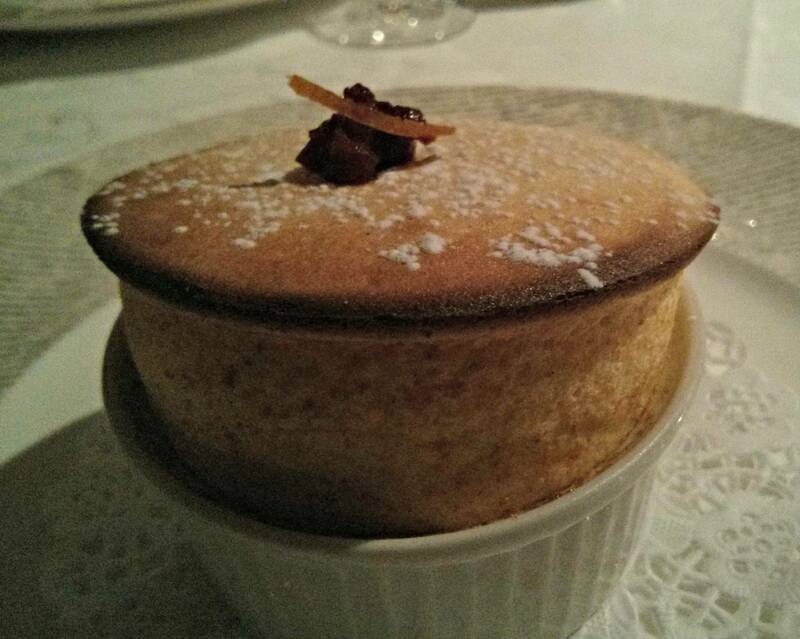 The souffle was light, fluffy as a cloud with good orange flavour. Together with the cranberries provided a classic winter taste combination, and an outstanding example of a soufflé from a Roux kitchen. Souffle chaud a l'orange et airelles. 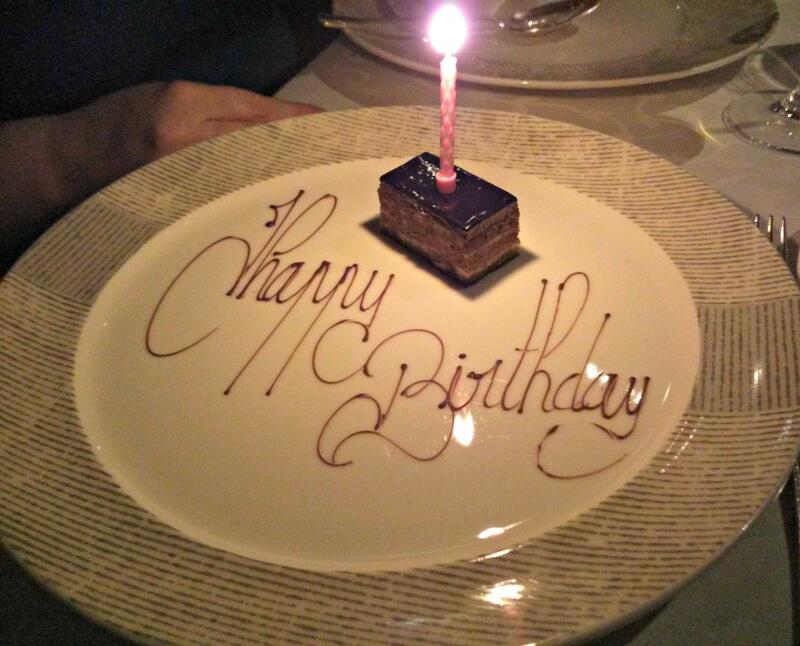 After being treated to an exquisite slice of coffee and chocolate birthday cake for my wife, our coffee's came with a huge selection of petit four's, each a perfect example of its kind and again the flawless patisserie I would expect from Michel Roux's kitchen. A tiny lemon tart stood out, as did the parmentier biscuit but all were amazing and we shared half of each. I was also treated to a little bit of theatre, the liquor trolley was wheeled up and I asked for a cognac, I was then given a description of their four best cognacs, and given a blind smell test and was asked to choose which one I liked, and was then shown the list with prices. Luckily I had asked for prices, one of the ones I liked was an 1879 bottle coming in at £210 a glass! Not being a billionaire I eventually settled on the "cheapest" on offer, a 40 year "Inspirations" bottled for the Inn itself. This was a lovely cognac, smooth, potent and yet not a hint of harshness. We finished up and stumbled up to our room. I was really glad our journey was measured in mere feet that night! The service throughout was exemplary, a host of waiters acting in silent choreographed concert to provide for every need of the guests, acting with near psychic abilities to pick up exactly what you wanted and when. Diego chatted with us a few times, a charming gentleman who instantly knew how to put you at ease and ensure you enjoyed your meal. A number of spectacular a la carte dishes were served by the table, with duck and chicken being carved and plated up to a number of people. I particularly enjoyed watch Diego himself serve an impressive looking sea bass baked in a seaweed and salt crust, the crust being removed and the fish deboned and filleted quickly and efficiently, not a second wasted or a single morsel missed. At one point I dropped my napkin, and before I had barely even noticed it had dropped, a waiter silently appeared at my side, picked it up and replaced it with a fresh napkin held in between fork and spoon. The sommelier was also wonderful, explaining each choice and checking we enjoyed the choices. Although service we've had elsewhere has always been excellent, nothing was quite as masterful and professional as the team at The Waterside Inn and this was clearly why it is a 3 star restaurant. The appearance of the food itself was outstanding, everything was very classic, the presentation beautiful without any modern touches, no paint brushed sauces, superfluous flowers, dry ice or fancy custom serving plates. Not a hint of modernist techniques, no foams or gels to be seen. The dishes themselves were made with the best ingredients, cooked to perfection with recipes born of decades of experience and near flawless. Every single mouthful was to be savoured and remembered. 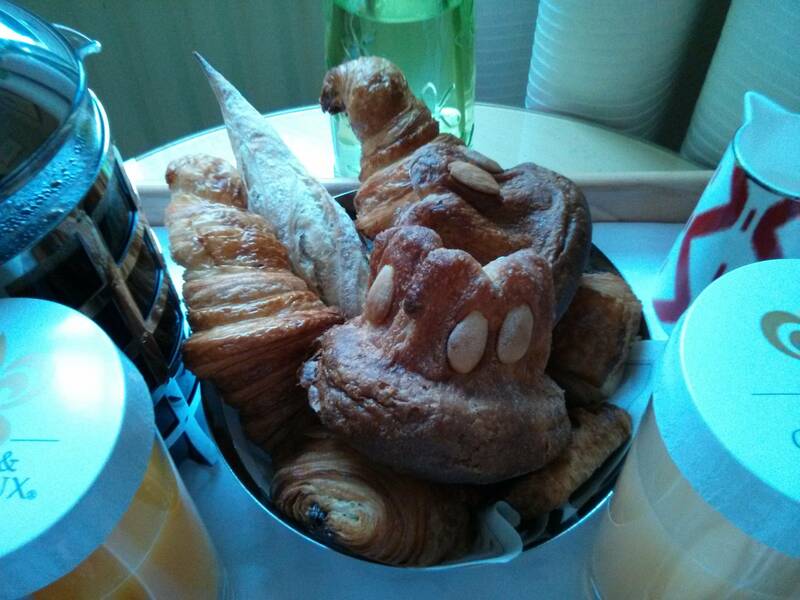 The next morning saw a fantastic breakfast tray, with an excellent brioche and pastries, again sealing the reputation of the kitchen for patisserie. They are literally masters of their craft. The Montgolfier Room. Note the balloon prints! 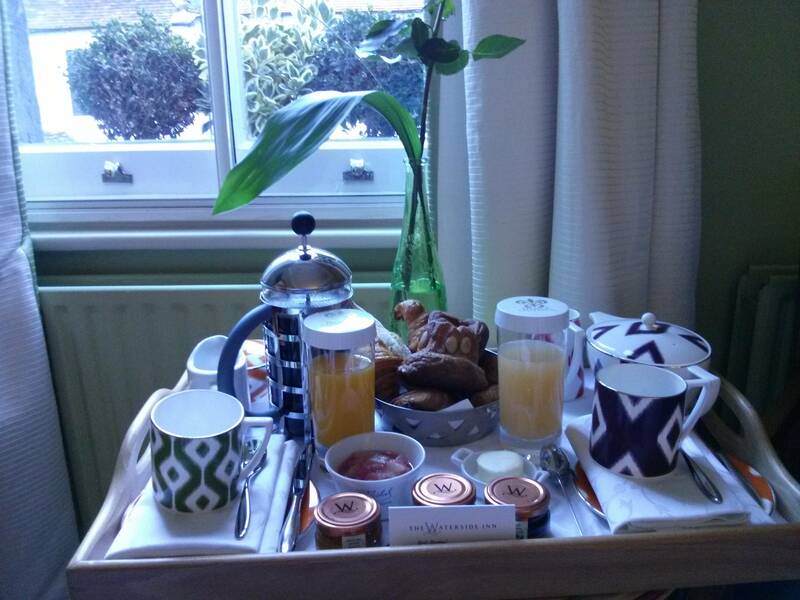 Our signature experience was £560, this included service and VAT and covered 2 glasses of champagne, the food, a standard double room, breakfast and a copy of the brother's "Patisserie" signed by Michel Roux, a bag of goodies including half a bottle of their signature champagne, a lovely Wedgewood plate and some coffee and jams. Addtionally, the wine flight was £93 a head, and cognac £39. Although very expensive I don't believe anything was overpriced, just a case of you get what you pay for, and in this case you got the best of everything. The whole experience of the evening was one we will always remember. Ametsa by Arzak Instruction, the London outpost of Arzak in San Sebastian, opened its booking line today at 9am, and I was through at nine on the dot, booking a table for Saturday 9th, the day after they opened! However double checking they had a vegetarian menu at the end of the call indicated that they did not, and I had to cancel! They may be the new hottest ticket in town, and an outpost of a fabled 3 star, but they have to be able to provide vegetarian options, they aren't in San Sebastian now. I believe every 3 and 2 star in the UK will cater for vegetarian and indeed all dietary requirements. I've read reports of vegan menus at The Fat Duck and Gordon Ramsay and as my blog shows, my vegetarian wife is catered for everywhere we go. I may try this with my brother, or on my own, but I am very disappointed we missed out on a lunch so soon after opening day, I made a real effort to get a booking the day the lines opened. Viajante is the restaurant of Nuno Mendes, a Portuguese chef with an impressive CV, having worked at some of the best restaurants around the world and previously providing Hoxton with Bacchus and a supper club based out his apartment. The dining room is quite small, seating I guess about 30 or so diners. The front of the room is the kitchen and plating area, with Nuno Mendes and a host of chefs quietly preparing the food. Lunch is a choice of 3 or 6 courses, or like us, you can arrange 9 courses when booking in advance. The menu involved choosing the number of courses and from then on it would be a surprise Dietary requirements are catered for without fuss, and a vegetarian meal was prepared for my wife and an 'anything goes' selection for myself. Whilst briefly waiting in the bar for the staff briefing to finish, we ordered some non-alcoholic cocktails, and these arrived at the table shortly after we sat down. I had a rather delicious marmalade, apple and honey concoction, my wife something pink involving hibiscus, including a beautiful hibiscus flower held in place with the straw. We decided on a few glasses of wine and left it to the sommelier to bring out something for us during the amuse bouches. 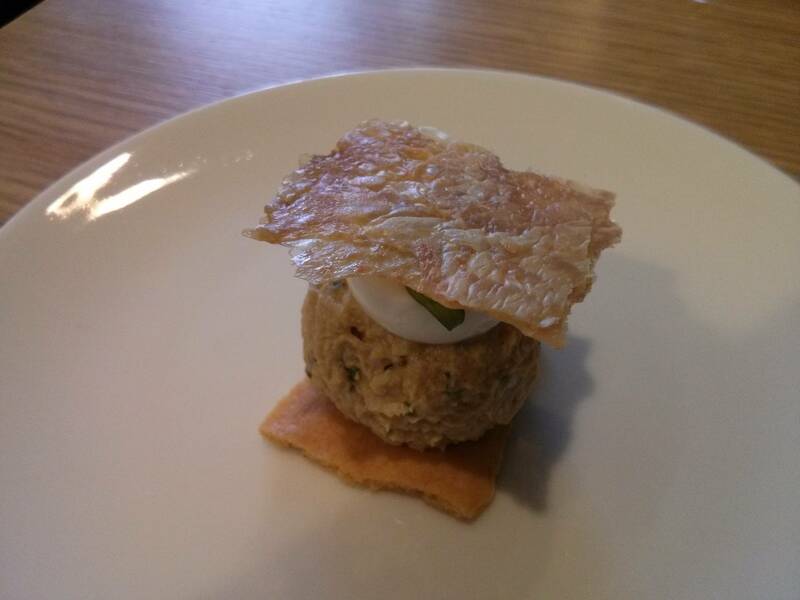 The first of many amuse bouches was Thai Explosion III, for me a crispy base, chicken mousse and quails egg topped with chicken skin. Redolent with Thai flavours, this was a fantastic start, especially the use of chicken skin, for they had captured the taste of the perfect moment of chicken skin; stolen whilst carving the roast and no one is watching. 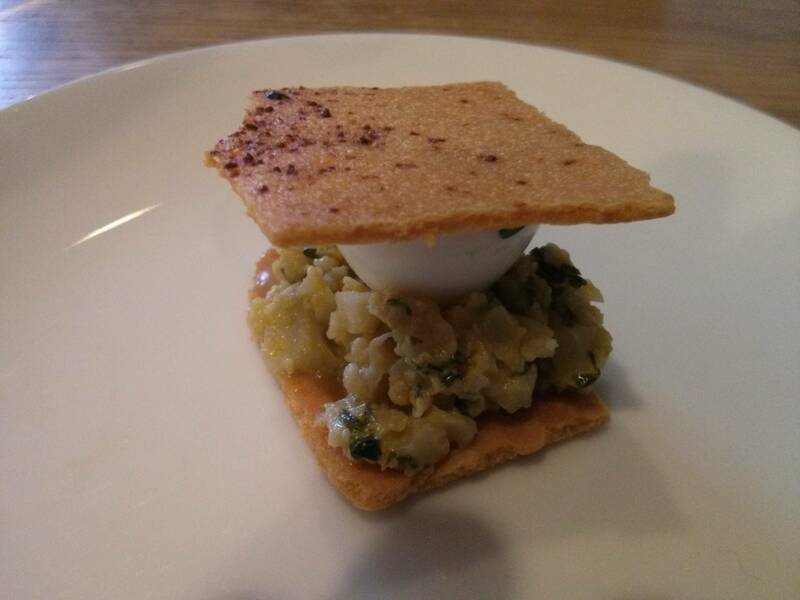 My wife's was very similar, except chicken mousse replaced with cauliflower and the crispy bit doubled up. 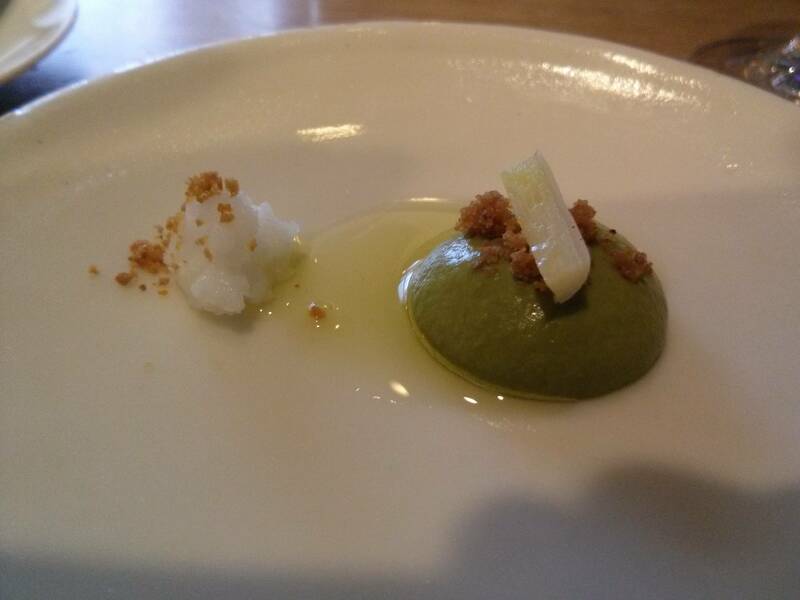 Following this was an unusual dish, Amaranth, a grain from South America, topped with sweet popcorn and on a base of sorrel puree. 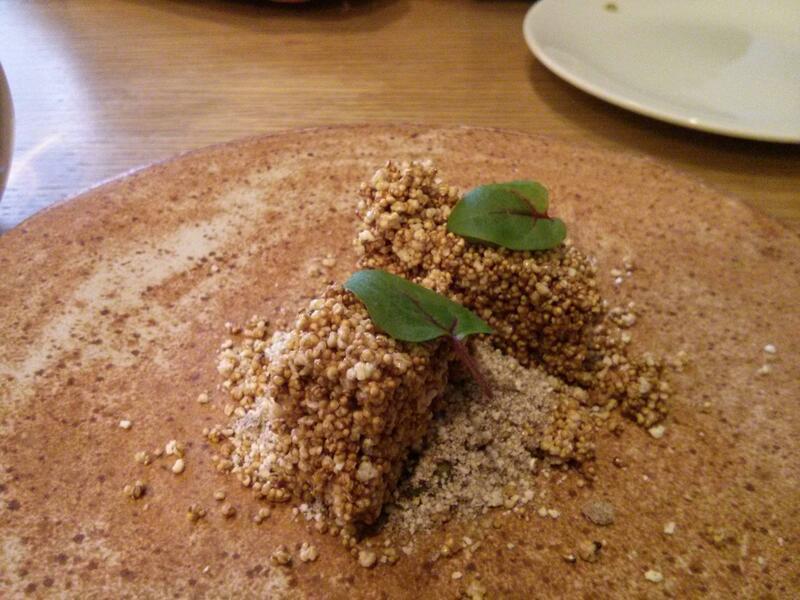 This was a sweet crunchy bite, and much like a posh crispy bar, well matched with the earthy sorrel. Next up, an incredible smelling and tasting, almost raw Palamos prawn in oil for me, and smoky enoki mushrooms for my wife. After this Gordal Olive Soup, an intense olive puree matched with a pile of garlic with something I couldn't identify providing a sweet note and crunchy texture. This was a delicious few spoonfuls we both enjoyed, the taste of olives being perfectly captured. Next up was an unusual combination of potato and yeast. 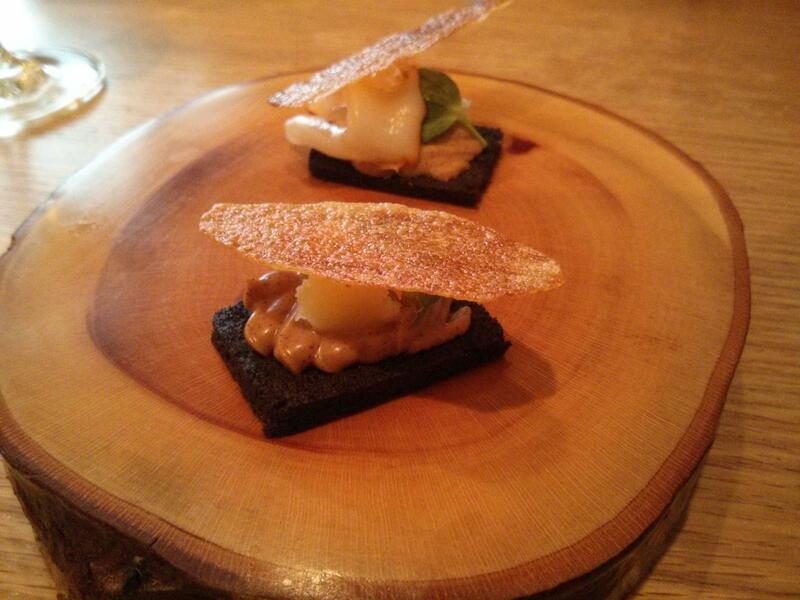 On a soft black bread, a puree of yeast was topped with potato and a potato crisp, and for me an additional sliver of lardo. This was a great combination of potato, paprika, melting fat and the hint of marmite from the yeast. 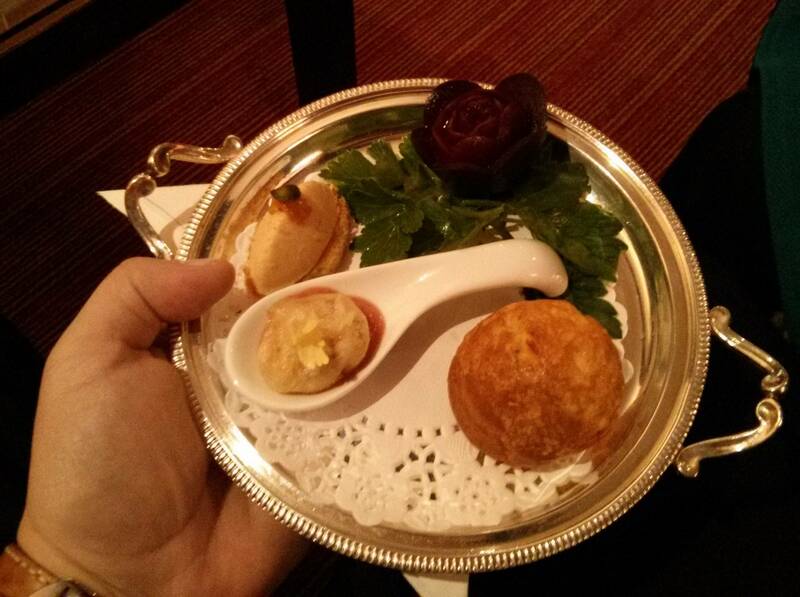 Finally, the crowning glory of a winning combination of amuse bouches, the bread was presented. 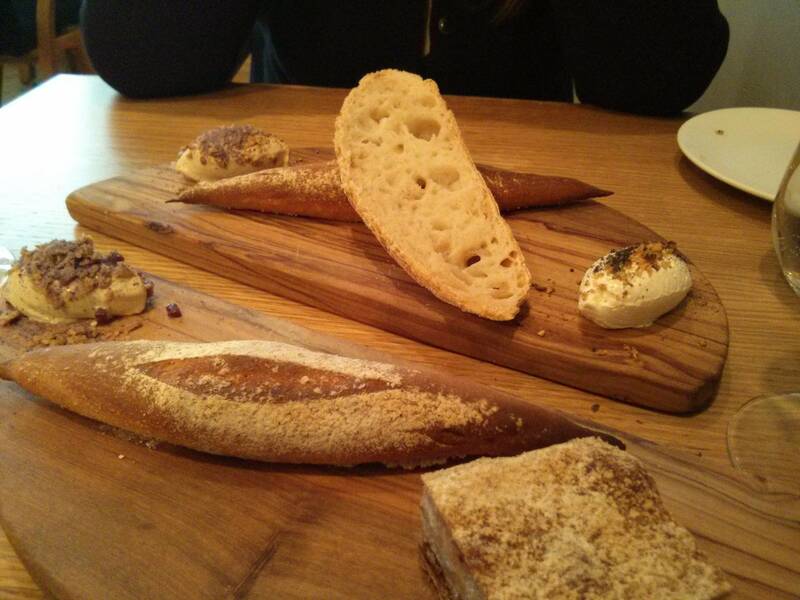 We both had a baguette, and I had a bread with Iberico ham, and my wife a sourdough. A brown whipped butter was generously topped with Iberico ham and crispy chicken skin for me, and crushed sunflower seeds and for my wife, we also both had a butter topped with ash and nuts. The warm bread was of very high quality, some of the finest I've had, and the baguette with the whipped butter, chicken skin and ham was simply divine, a plate of sublime genius. Our first glass of wine came during the amuse bouches, a Josmeyer Riesling "Le Kottabe" 2010, and a Domaine Weinbach "Close des Capucins" Sylvaner 2010, both from Alsace. We tried both, and I took the Domaine Weinbach, a fruity, fresh white. After an hour of amuse bouches and bread the first of our nine courses were bought to the table by Chef Mendes himself, he described the dishes; for my wife a gorgeous selection of daikon, radishes, herbs and flavoured with liquorice on to which a parsley sauce was poured. For me 2 scallops, sat in their own cooking juices, on to which he added frozen beach herbs from a pan. This was an interesting dish, providing a new sensation as the herbs were incredibly cold, I suspect they might have been frozen using nitrogen. 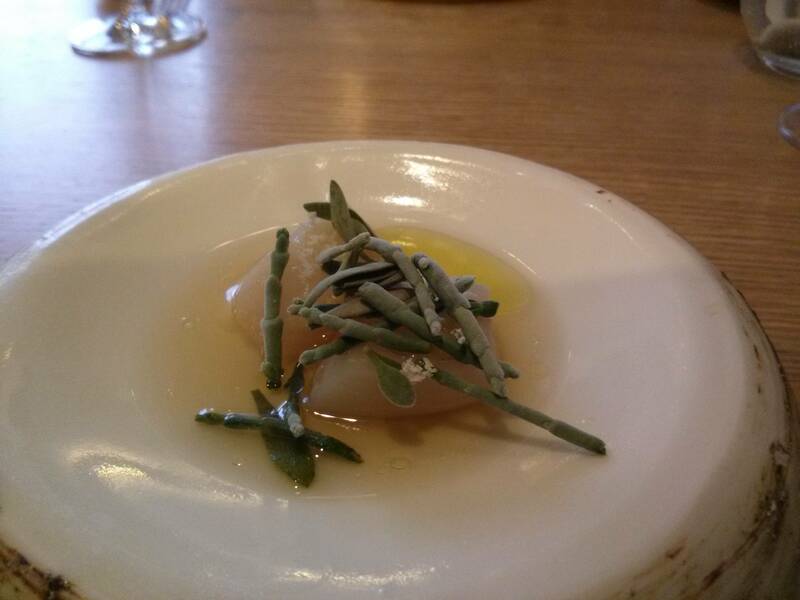 These, in particular the samphire added a salty note to the scallop, with the juices providing a taste of the sea. 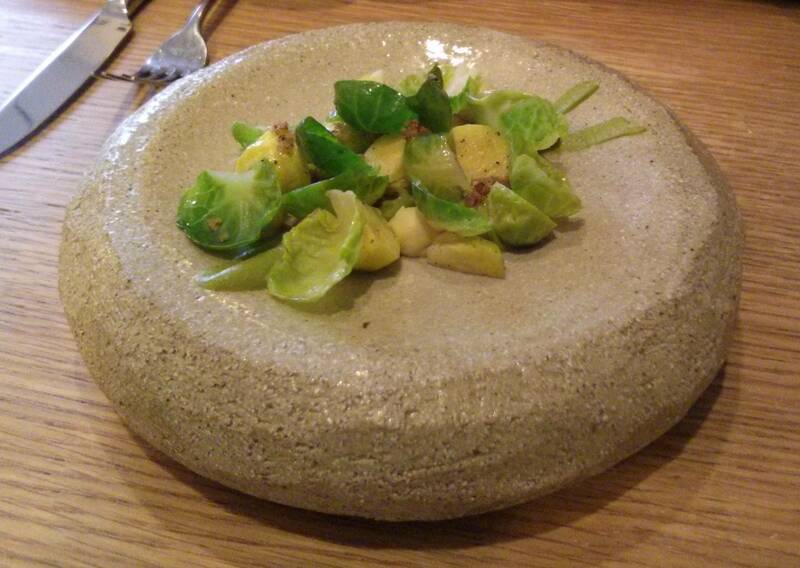 Our next course was Brussels sprouts and rye, with a plump langoustine for me. Brussels sprouts are a much maligned vegetable, as they can be the stuff of nightmares when overcooked, but here, barely blanched and almost raw they were fantastic dish, especially paired with two fantastic creamy puree's. My wife in particular loved hers, being a huge fan of sprouts. For me, the langoustine was the star of the dish, perfectly cooked, its flavour matched the slight bitterness of the sprouts and creaminess of the puree's perfectly but by no means did my wife's dish lose out by not having the langoustine, the sprouts certainly shone in their own right and made her dish one of her favourites of the day. Scallop with frozen beach herbs. Daikon with liquorice and parsley. 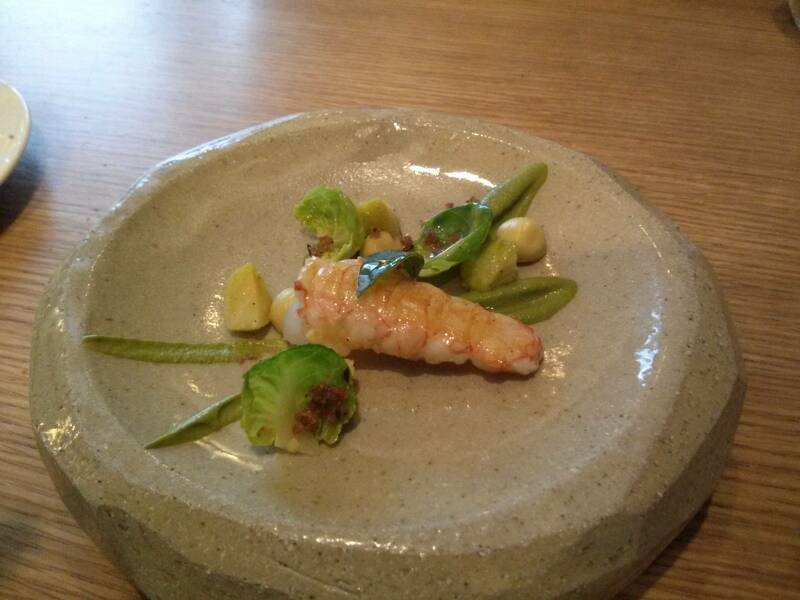 Langoustine with Brussels sprouts and rye. I had a really fantastic dish next, a gorgeous plate of pike on a base of egg yolk, topped with pike caviar and sea bass roe. I haven't had pike since my childhood holidays in Brittany, and the meaty fish went beautifully with the sweet, somewhat salty caviar and roe. The flavours were quite subtle, pike isn't really like other freshwater fish normally found on menus, and its caviar were noticeably sweet and salty, the taste of the roe was there without overpowering, and these all went really well with the custardy egg yolk base. 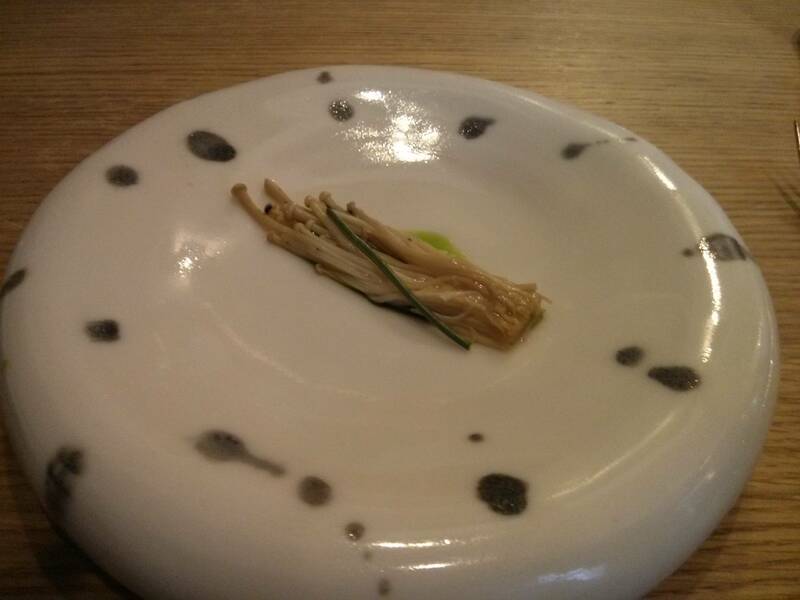 My wife's course was also equally delicious, a milk skin topped charred leeks in an leek ash emulsion. Milk skin is quite unusual, almost like a pasta, it has a bit of a bite to it, held the flavour of the leek emulsion very well. 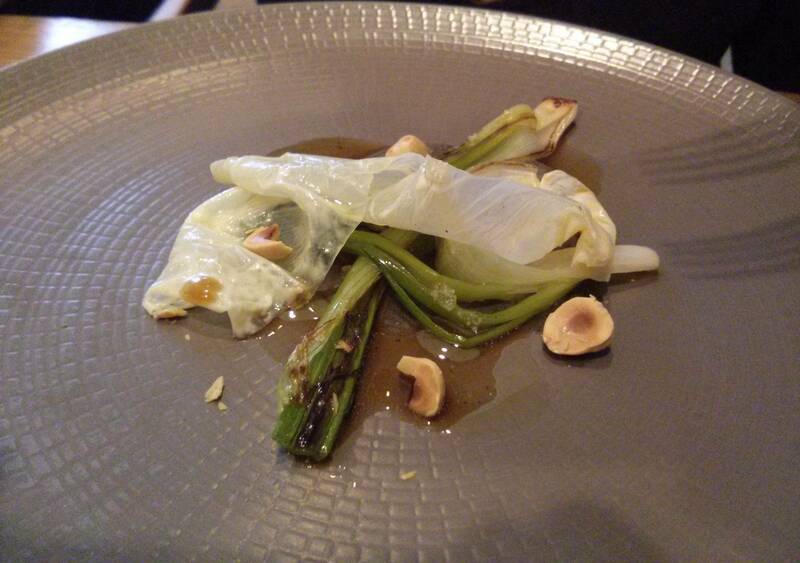 The leeks were particularly fine examples of their kind and this was a very well crafted dish. 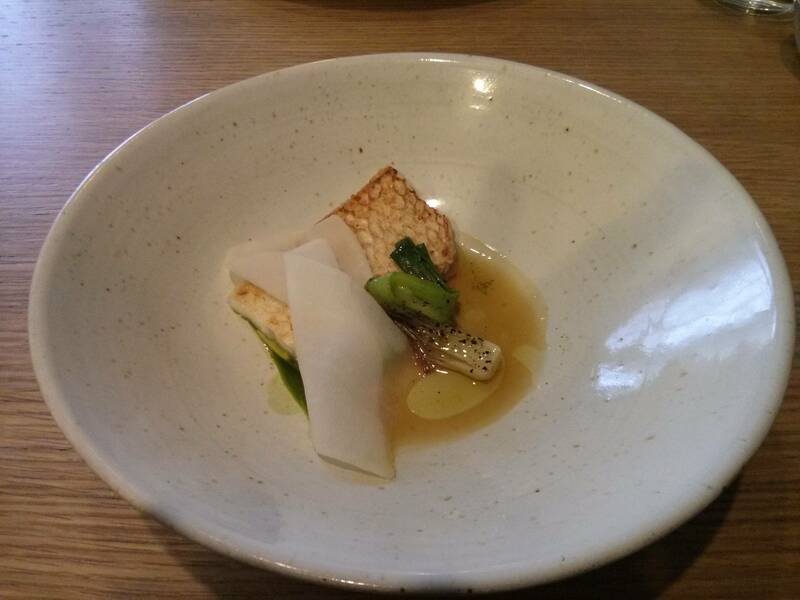 Next up was a bowl with a barely cooked almost raw belly of sea bass, crispy skinned yet with flesh soft as can be, flavoured with a light sauce with a subtle vanilla it was presented with a really exceptional piece of spring onion and strip of daikon. 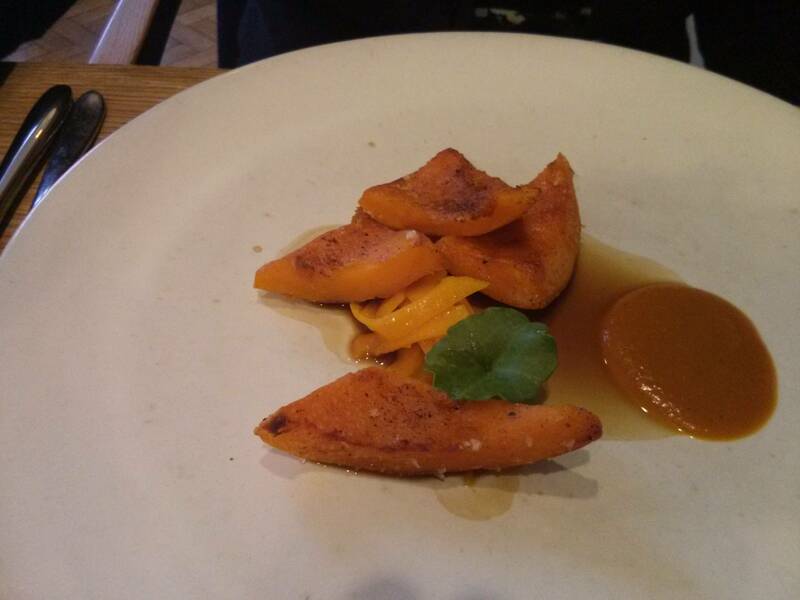 My wife had a very interesting dish of carrot, this was cooked with molasses, slightly charred yet still crunchy on the inside, it came with a carrot crisp. Whilst still savoury, this featured some sweet flavours highlighting the natural sweetness of carrot. It looked pretty as a picture too. 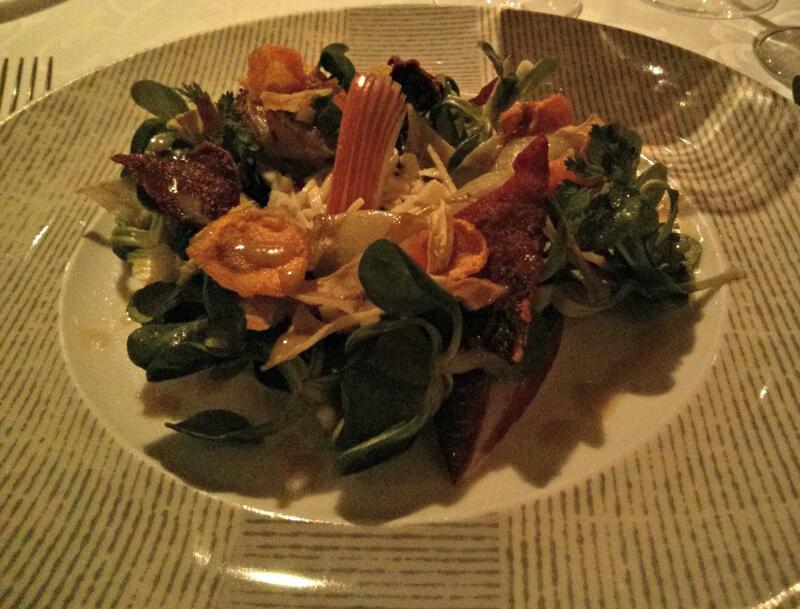 We both then had a really good salsify dish. Poached in milk and butter, the salsify lay on a thick potato broth and came with a chanterelle mushroom, sesame seeds. 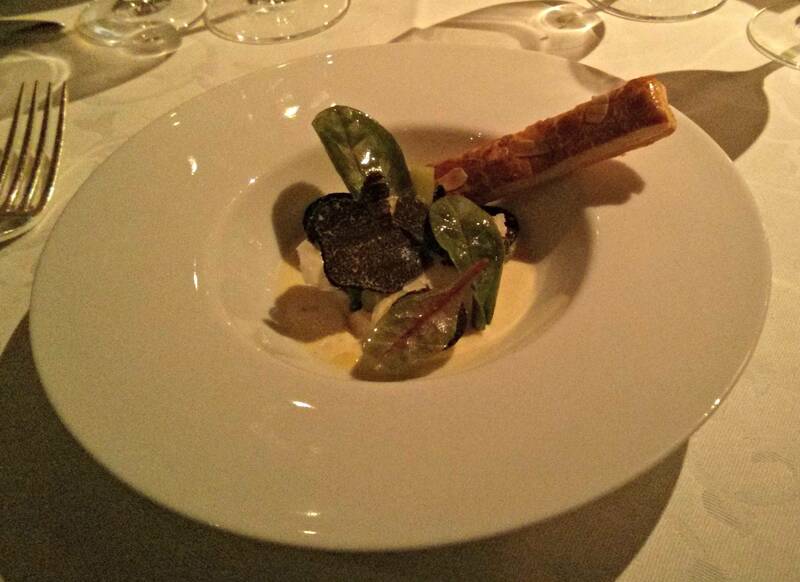 spruce bark and a generous shaving of black truffle. All matched well to to make a really well tasting vegetable dish, the aromas of truffle, the sweetness of salsify, the nutty tang from the sesame all underlined by an intense, thick potato broth. 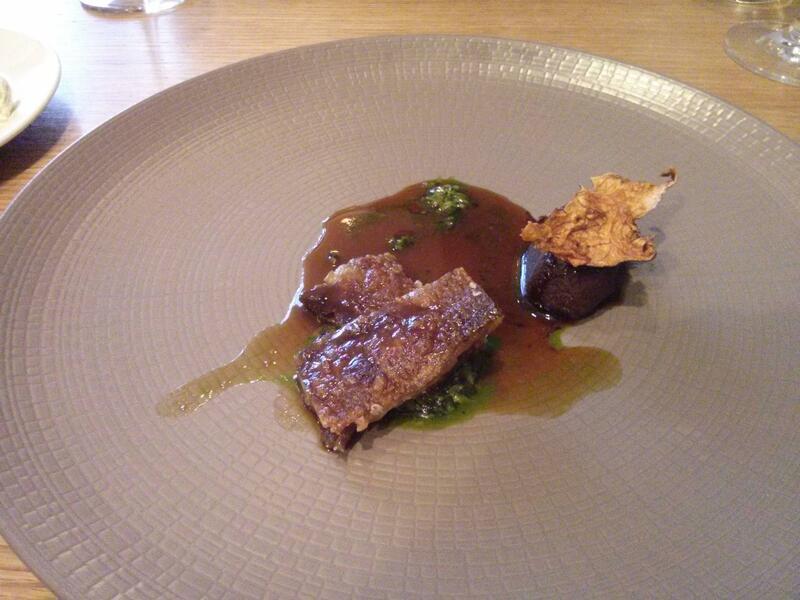 Definitely an example of how very high quality dishes don't need meat or fish. We also had another glass of wine, I had a particular aromatic Portuguese white, a blend of two grapes which alas I did not record the name of. Pike with roe and egg yolk. Charred leek with milk skin and leek ash emulsion. Sea bass with vanilla and daikon. 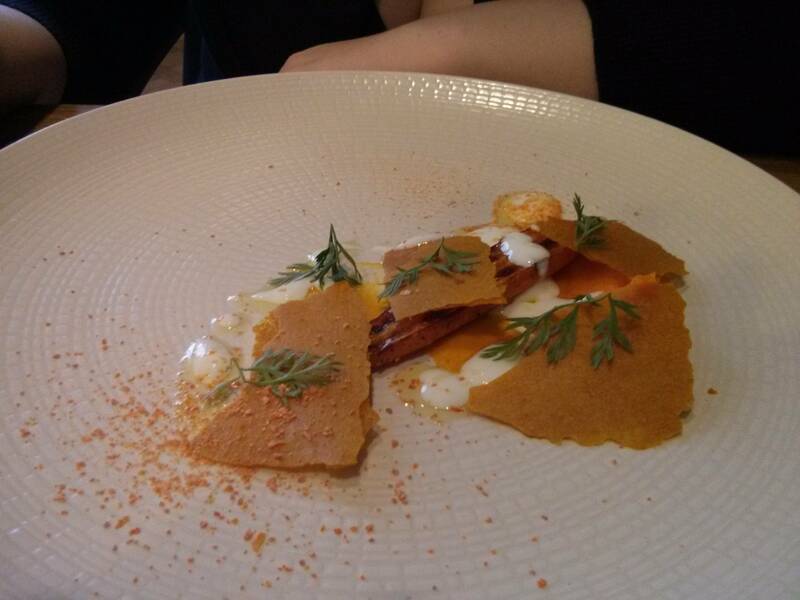 Carrot with molasses and buttermilk. 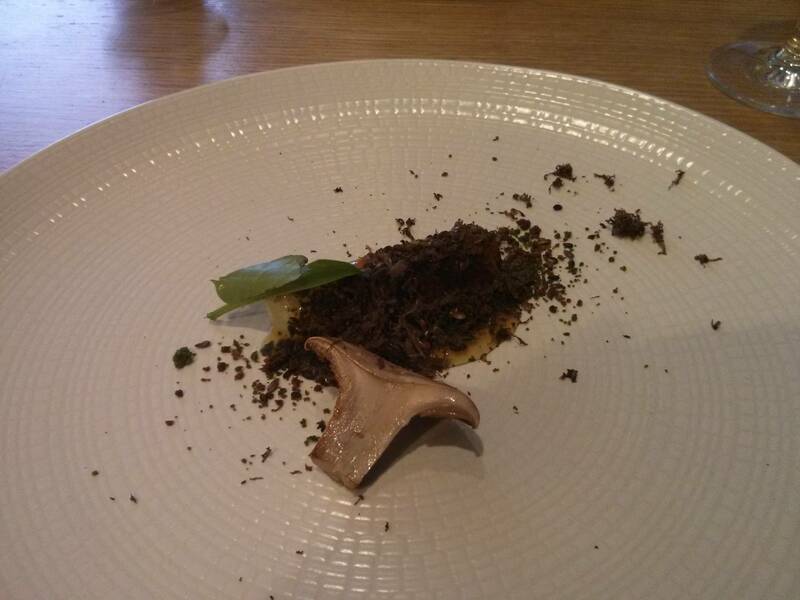 Salsify with spruce bark and black truffle. 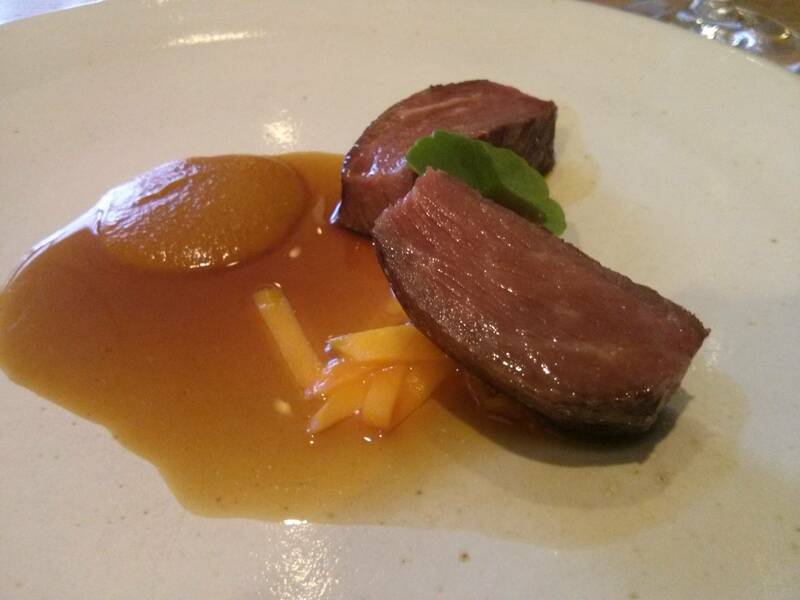 My first meat course was somewhat unusual, a presa, the cut between the top of the shoulder and the beginning of the loin of iberico pork came with a pork jus, and some really unusually flavoured strips of fermented chesnut squash. On their own the fermented squash pieces were a really odd flavour, hard to describe and I wasn't even sure if I liked them at first, but when a few slivers were paired with pork it worked really well. The iberico presa was marvelous, intense in pork flavour, cooked almost rare it still showed the marbling iberico pork is famous for and it left me with a lasting impression of how good pork can be, and just how well it could taste. My wifes dish was similar, except the fermented squash were paired with some gorgeous hunks of roasted pumpkin. Again the fermented squash went with the pumpkin really well, and like me she found it too intense on it on its own. The bold and different ingredient made both dishes an unusual yet enjoyable experience. if i remember rightly, a pork and chicken jus. The tail was basically, the finest, most flavourful, crispy and simply awesome pieces of pork crackling ever to grace a plate, an absolute delight and worked incredibly well with the jus, a gorgeous sweet piece of artichoke and the nutty picada. Iberico presa with fermented squash. Iberico tail with Jerusalem artichoke. 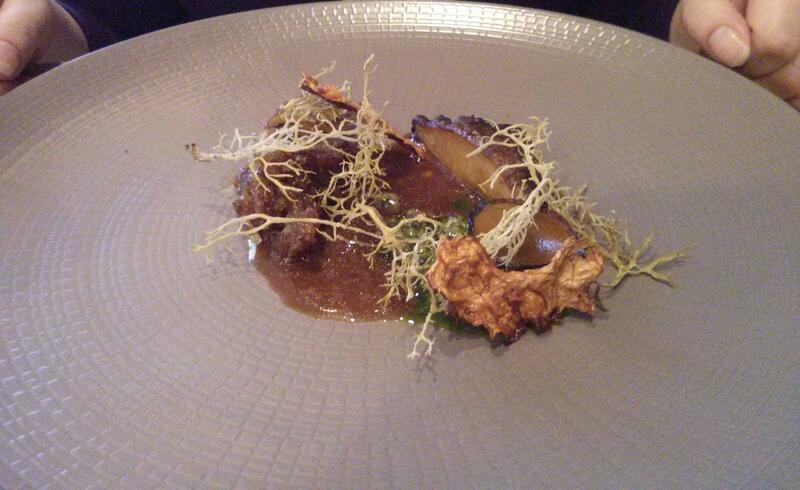 Jerusalem artichoke with picada and moss. Dessert was started with a highly unusual dish, Cucumber with reduced milk and lemon. 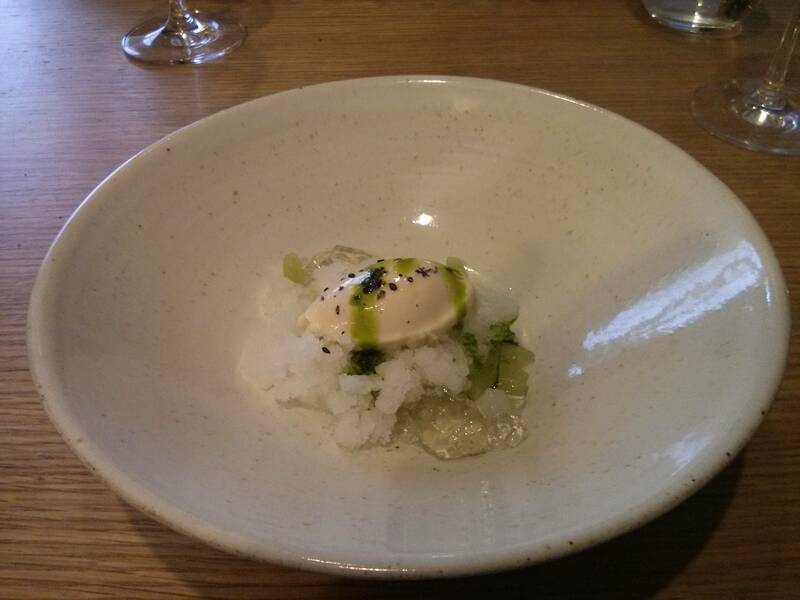 This refreshing palate cleanser was a combination of sweet with some savoury elements, the granita and ice cream slightly sweet, the cucumber incredibly flavourful, some pieces plain and others smoked and intense, with an aromatic jelly adding another element. 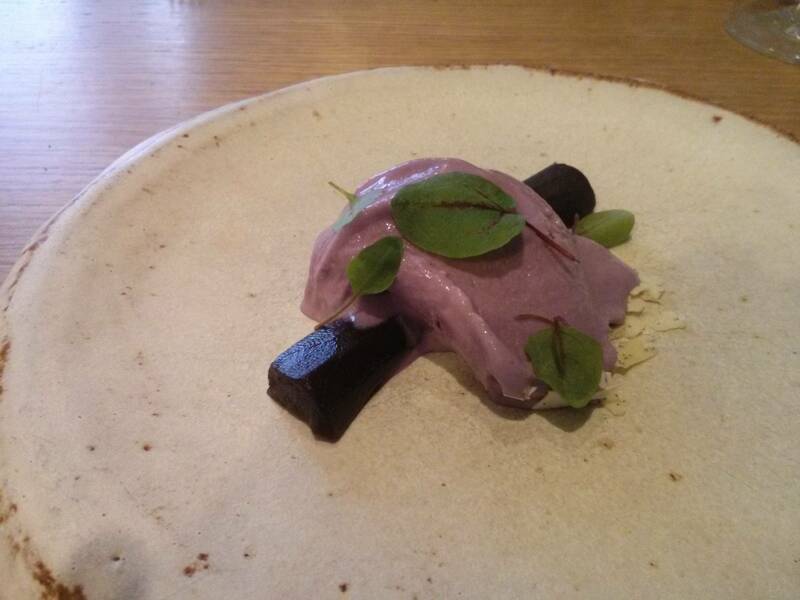 The next dessert was one of the most unusual I've had, a piece of black carrot, prepared so it was sweet and fruity yet barely a hint of carrot flavour provided a crunchy texture, this was accompanied with a vibrant purple toasted caraway ice cream. 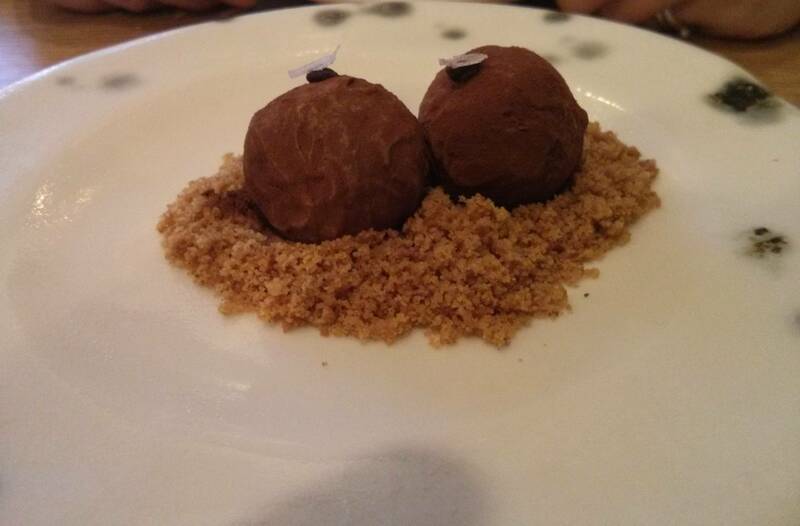 The flavours and textures worked really well, not too sweet, yet definitely not savoury, this was a work of genius and highly memorable dessert. Following this was Milk, a milk ice cream, some sort of dry frozen milk, a crispy milk wafer and powdered milk. This again worked really well, a light refreshing end to the meal, the flavours of milk well defined, with a hint of curd, yet nothing too sweet. 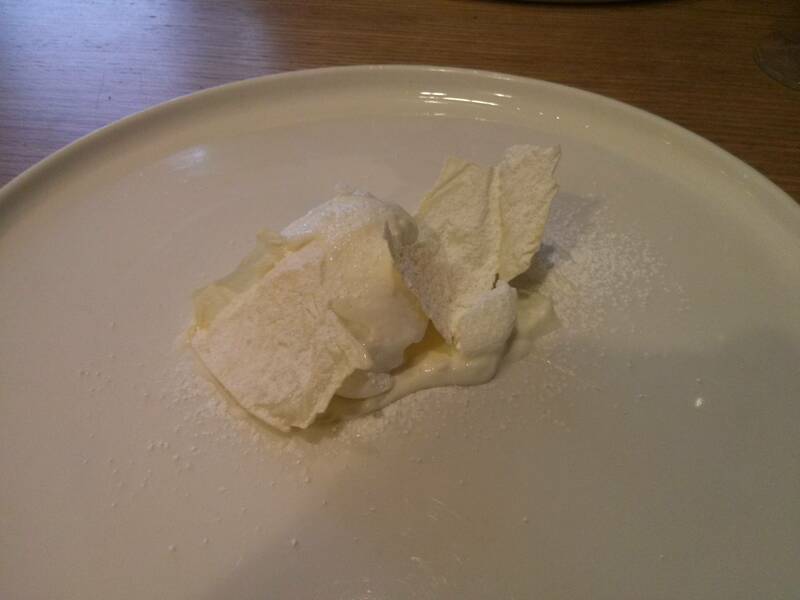 The wafer and dry frozen almost meringue like pieces providing some unusual textures. Finally coffee came with petit fours, the first an incredible nitrogen frozen olive oil and lemon morsel, with a texture somewhat like toffee yet a really light olive oil and lemon flavour. 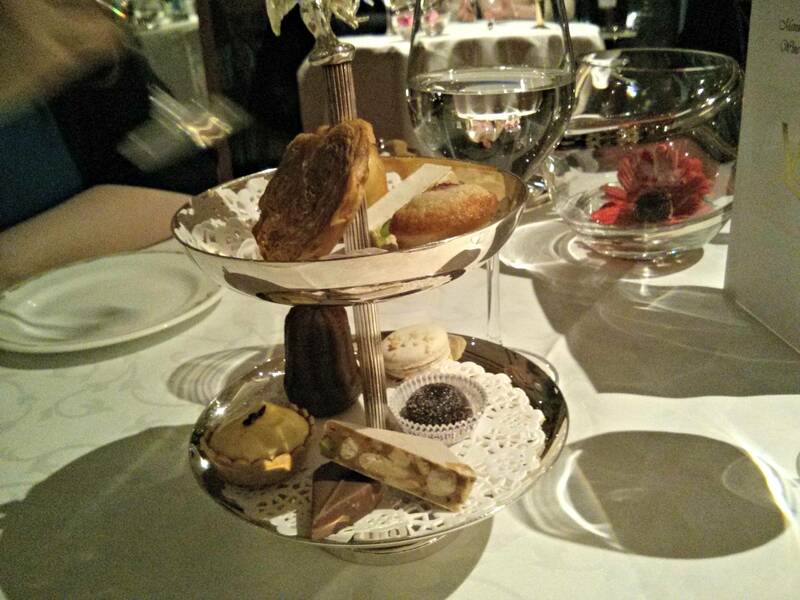 The second was a white chocolate centred truffle flavoured with the highly unusual addition of porcini mushroom. The mushroom flavour was quite intense yet worked with white chocolate and the fact it worked was a really pleasant surprise. We were also presented with a menu showing what we had enjoyed over the previous four hours. Cucumber, reduced milk and lemon. Black carrot with toasted caraway ice cream. White chocolate and porcini mushroom truffle. Over the four hours we spent in Viajante we enjoyed an epic cornucopia of dishes providing a host of new experiences and flavours. I love the format of a surprise tasting menu, each course an unknown factor but arrive to your delight and eagerness to indulge in the gorgeous food presented. Nuno Mendes and his kitchen deliver each time without disappointment, each dish was innovative, unusual, technically perfect and fantastic in execution, you can see and taste the passion which drives the chef and his staff. It must be mentioned that my vegetarian wife was catered for just as well as myself, with all dishes having a vegetarian alternative or replacement that were equally innovative and exciting. Service and surroundings were equally pleasing, my wife in particular enjoyed the music being played, someone obviously had similar tastes!